Donate now to help someone get to work. YOUR GIFT MAKES IT POSSIBLE TO GET ON THE BUS! 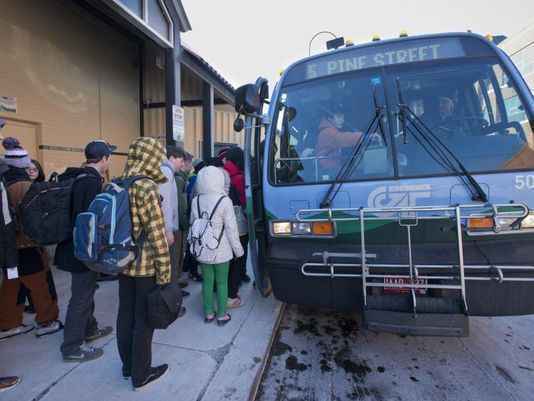 A ten-ride pass from Green Mountain Transit costs just $12. Imagine, just a bus pass that makes it possible to get to work. When you give to our Job Support Program, you help people build stronger futures. Funding for our Job Support Program has been severely cut, which puts it in serious jeopardy. This program helps people get to work or to an interview with free bus passes. Last year we helped 395 people to do just that, and 86% said the program helped them to be more financially secure. Current funding cuts mean we cannot continue this program after July. "Am I ready to say that this service is going away? Not quite yet." Travis smiled ruefully and rubbed the back of his neck. "The CVOEO Development Director and I are working to try and identify other sources of funding. The service may change and we may not be able to serve as many people. I am just not at the point of saying that this service is over with, not yet. There are simply too many people who have told me how important this program is, how much it has helped them." I'm in! For 20 trips back and forth to work. What a difference a bus pass makes! Everyone soes better when they can work!